Keeping your home comfortable no matter what the temperature is outside is a huge priority for every homeowner. Here at Quality Air Heating and Air Conditioning, we share that passion and we treat all of our customers as if they were our own family or friend. 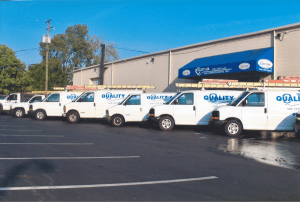 If you’re looking for any heating and air conditioning service in Delaware, OH the company to call is Quality Air Heating and Air Conditioning. We can work on a huge variety of HVAC systems and we offer a full spectrum of services including installation, repair, maintenance, and replacement. We’re available 24/7 for emergency services for those times when you need a professional technician after hours. Give us a call today for any service that you need for your heater or AC system. Heating is critical to your home’s comfort here in Ohio during the winter. Quality Air Heating and Air Conditioning provides comprehensive heating service in Delaware, OH for many different types and brands of systems. If you need a new heater installed, our experts will work with you to figure out exactly which type and size of unit is best for your home and your budget. If you aren’t getting enough heating, don’t suffer through the cold winter nights. Call Quality Air Heating and Air Conditioning for 24/7 heating repair. Our technicians are friendly, highly trained, and dedicated to your complete satisfaction. Here at Quality Air Heating and Air Conditioning, we know how frustrating it can be to have your heater break down on you-especially when the temperature starts to drop. We also know that you can’t plan on when your heating system is going to break down so we provide 24/7 heating repair in Delaware, OH for many makes and models of heaters. Whether your heater is making a strange noise or your heat pump isn’t delivering enough heating, our technicians will get to your home quickly, find the problem, and get your system back up and working again fast. Don’t let your home’s comfort deteriorate because of a faulty heater, call Quality Air Heating and Air Conditioning today. Probably one of the most common causes of heating problems is poor installation. Whether it’s a furnace, heat pump, ductless mini split, or geothermal system, call Quality Air Heating and Air Conditioning for quality heating installation in Delaware, OH. Heating systems are highly complex and if you have a non-professional or amateur install your new heater, it could cause the system to fail prematurely or not operate as the manufacturer intended. Call us and our technicians will work with you from start to finish: we’ll help you find a great system that matches your home’s size as well as your budget. While the Buckeye State can freeze in the winter, it can also get pretty hot and humid during the summer. For those times you need to have a terrific air conditioning system. Quality Air Heating and Air Conditioning offers total air conditioning service in Delaware, OH for all types of systems. We can install a new AC unit in your home and we can also repair or service your current system if it isn’t working well. Give us a call today and one of our Delaware, OH air conditioning service professionals can answer any questions that you might have. With all the use that your AC gets during the summer, it should come as no surprise that it will eventually run into problems and require repair. Quality Air Heating and Air Conditioning is proud to provide fast, high quality, and honest air conditioning repair in Delaware, OH. Whether your AC is leaking water, covered in ice, or if it just isn’t producing enough cool air, call us immediately. We’re available 24/7 because we know that things can happen unexpectedly. We often find that homeowners wait to see if the problem with their AC will go away on its own and all that does is allow the problem to get worse so make sure that you call us as soon as you suspect that something has gone wrong. If you’re building a new home and need an air conditioner installed, or if your current one has come to the end of its life, Quality Air Heating and Air Conditioning is the company you want handling your air conditioning installation in Delaware, OH. Our technicians are highly trained and have years of experience working with all different kinds of AC systems. One of the most important parts of the process is figuring out what size of air conditioner you need for your home. If you get an AC unit that is too large or too small it could end up causing big problems for your home’s future comfort and efficiency. Give us a call today and one of our friendly specialists can help with any questions that you might have. Air conditioning maintenance is an overlooked component of home ownership. Like getting oil changes or tire rotations for your car, your air conditioner needs regular tune-ups and service as well. Quality Air Heating and Air Conditioning provides air conditioning maintenance in Delaware, OH for all types of systems. Our maintenance program includes regular visits from our technicians during which they’ll clean and inspect your entire system so that it will work as efficiently and effectively as possible. In addition to reducing repair, increasing efficiency, and extending the life of your system, our maintenance program members also get reduced pricing, priority service, and many other perks as well. Replacing your air conditioning system can be a difficult task given that there are so many different types and sizes of AC units on the market. Let Quality Air Heating and Air Conditioning provide all of your air conditioning replacement in Delaware, OH. Our friendly specialists will work with you from start to finish to help you find a great system that matches your budget as well as your home’s needs. Call us today if your AC has failed permanently or if it is making any unusual noises, operating inefficiently or if it is starting get old. As a business owner, you’re probably aware that your HVAC system is one of the key components of your success. If your clients, customers, tenants, or employees aren’t comfortable in your business, it could reflect poorly on you. That’s why getting professional commercial HVAC service in Delaware, OH from Quality Air Heating and Air Conditioning is so important. Our technicians have the skill, training and years of experience to help you with any service that you might need. We are dedicated to providing top quality service on every job so call us today if you need any kind of commercial HVAC equipment installed, repaired, replaced, or maintained. Many businesses run their heating and air conditioning systems almost constantly in order to keep their customers or employees comfortable. However, all this use can eventually lead to your system developing a number of issues. If you aren’t getting enough heating or cooling or if your system is making any unusual noises, call Quality Air Heating and Air Conditioning for 24/7 emergency Delaware, OH commercial HVAC repair. We can fix any type of system that you have and our experts can handle any type of problem that your HVAC system might be having. Poor installation is one of the leading causes of HVAC problems. There are too many components that need to be hooked up correctly and too many calibrations to be performed that a non-professional is bound to perform one of these tasks incorrectly. Quality Air Heating and Air Conditioning offers total commercial HVAC installation for all types of systems. We’ll work with you to find the perfect-sized unit for your business which will help ensure that it operates properly. Our installation professionals will then install your unit quickly so that you can get back to running your business. If you’re looking for a way to keep your HVAC system operating as long as possible and efficiently as possible, then regular maintenance is probably your best bet. Fortunately, Quality Air Heating and Air Conditioning offers a fantastic maintenance program for businesses of all types and sizes. Like regular oil changes for your car, getting your heating and air conditioning system regular tuned up is a great way to keep it working at peak performance. Doing this could increase the efficiency of your system as well as reduce repairs. Additionally, our maintenance program members also get access to reduced pricing, priority service and many other perks. Call us today to learn more. Heat pumps are one of the most common heating and air conditioning systems in the country. Not only are they incredibly efficient, but they also can both heat and cool your home which is an ideal solution for homeowners who want both their heater and AC system in one convenient unit. Quality Air Heating and Air Conditioning is the place to call for all your heat pump services in Delaware, OH. We can repair any issue that you’re having and we’re available 24/7 for emergency repair for those times when you system breaks down unexpectedly. If you’re looking to have a heat pump installed, our professionals will make sure that your new unit is the right size and that it gets installed quickly and with the high quality that you deserve. The furnace is the work horse of many of our homes, providing efficient heating throughout the harshest winters. Quality Air Heating and Air Conditioning offers total furnace service in Delaware, OH including installation, repair, maintenance, and replacement. We can work on all types of furnaces including electric, gas, and propane models. If your furnace is making an unusual noise or if it is blowing cool air, call us for 24/7 furnace service in Delaware, OH. We understand the importance of heating here in Ohio, so don’t hesitate to call us the moment you suspect that something is wrong.